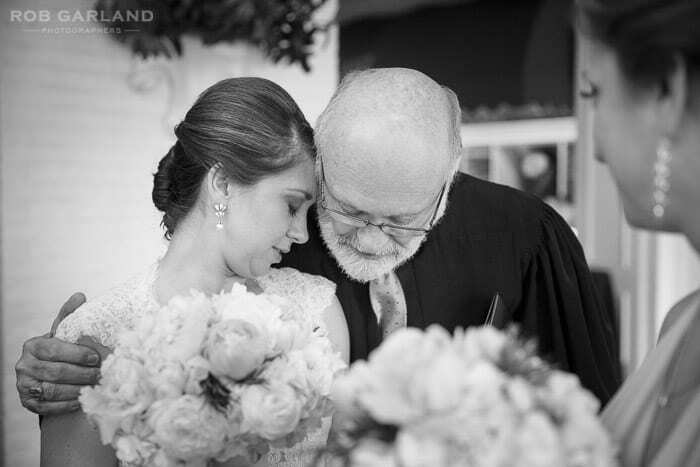 The essence of my photography style is to capture the soul of a person – I really want those moments that make up the reality of the wedding day. When editing images, I prefer a simple approach, not believing in “over-editing” in Photoshop – similar to my belief that too much “make-up” can take away the beauty of a person. This image is one of those examples – it’s a great moment – shown in black and white to keep the mind on the feeling and composition. Other than subtle dodging and burning and a normal RAW post processing adjustment, I prefer to work exactly as I worked with film – compose well, capture with correct exposure, and print accordingly. It keeps the integrity of the photograph. I also love layering – enjoying the framing aspect of this photograph by using the edge of a bridesmaid in the foreground of the image.